No matter what size your church is, getting your message (content) outside the walls of your building is a vital component to your mission. Historically, we did this through television broadcast and distribution of VHS tapes and DVDs (yes, really VHS tapes). Streaming services online is much more efficient and effective. For small-to-mid-size churches, however, streaming the services is not always an option; either due to cost, infrastructure, or personnel. 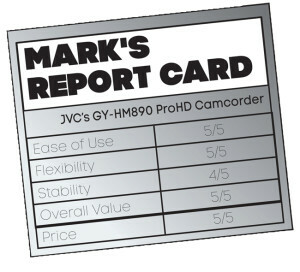 JVC recently introduced a camera that might remove those barriers, while also making a great camera in its own right. 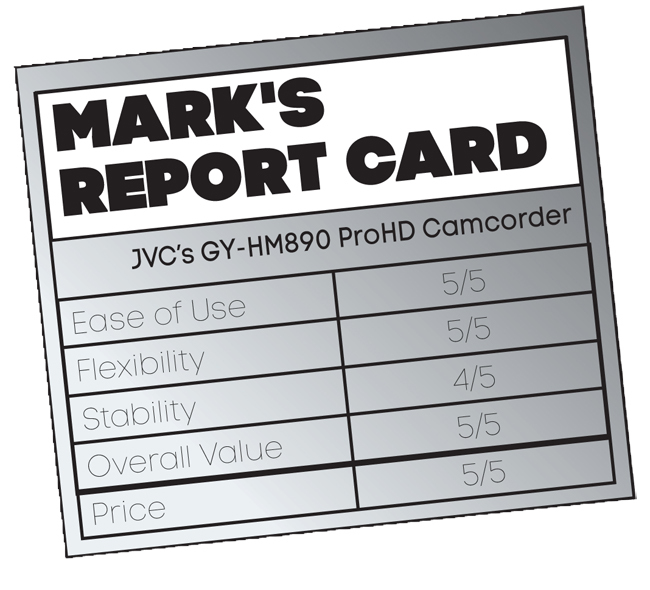 The GY-HM890 ProHD camcorder is a full HD shoulder-mount pseudo ENG camera; it is light enough and not bulky to hold in a field application (our shoulders thank you). 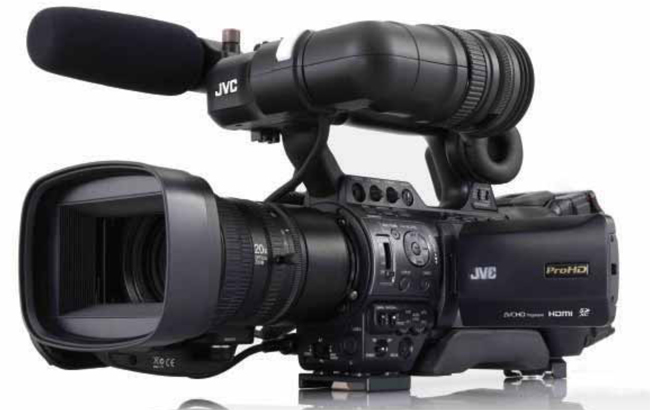 It also has a 68-pin connection that utilizes JVC fiber or multi-core camera modules and can be equipped with components for studio use (zoom/focus control, viewfinder, CCU, etc.). Three 1/3-inch 2.07 megapixel full HD (1920×1080) CMOS sensors, provide 12-bit readout and F11 sensitivity. Standard time code/gen lock connections are here as well. Several features stand out on this unit. One is the ability to record at 50 mbps in the H264 format, which I haven’t seen before on cameras of this class. Another is the Fujinon 20x interchangeable zoom lens, which really is impressive. We tested it at great distances and the image held up superbly. The camcorder also has a dual codec that lets you transmit live HD footage, or transfer files in the background, while still recording your shots. The GY-HM90 also allows for simultaneous non-compressed full HD SDI/HDMI outputs. This could allow the ability for churches to send the signal to multiple locations (depending on your setup) on or off campus. As someone who shoots a lot of footage outside, I like the option of three ND filters (1/4, 1/16, 1/64), instead of the typical two. One great feature videographers will love is the ability to choose your recording format: SD or HD (with a variety of resolution options) and the capability of recording different file formats, Final Cut Pro (.MOV), XDCAM EX (.MP4), AS-10 (.MXF), AVCHD (.MTS) or H.264 (.MOV) files). I typically shoot with several brands of cameras, and often have the headache of having to convert files to match whatever NLE I happen to be using. That hassle is gone with this feature. Simply put your SD into your computer and you are ready to go. I did find the menu system to be a little complicated and not as simple and intuitive as I would have hoped. What matters to most of us though is picture quality, and this is where those CMOS sensors doesn’t disappoint. We placed the camera in our tech booth which is at the back of the worship center. The footage of the musicians and choir, 70 feet away, was rich and crisp. There were no image artifacts or problems. It was stunning HD, even in the parts of our worship center that didn’t have great lighting. What separates this camera from the pack (even from previous JVC models) though is the strong IP integration. It contains a new built-in network connection engine, with 4G LTE/3G (via modems) Wi-Fi, and USB RJ45 connectivity options. This means you could do a direct file transfer from your offsite location straight to your computer at church/office/home. No more waiting for the team to get back from the overseas mission trip to get footage; now you can have it the same day! It also has the capability for live HD transmission (streaming) straight from the camera. While few churches may have need for live transmission from the field, this is a good solution for streaming your service straight from the camera, without the need for costly cabling, and other equipment. It truly could be the best option for churches that have never streamed their services before. To stream live you would need JVC’s BR-800 ProHD Broadcaster server, which manages the HD streams from the camera and sends the signal out to whatever stream host you want. With a MSRP of $9,995 for the camera and $2,400 for the Pro HD Broadcaster (plus a monthly data service fee), this is an affordable way for churches who have yet to enter the world of streaming to start sending their worship services and sermons to the world. Mark Varner lives in Franklin, Tennessee with his awesome wife and three kids. He is media director at First Baptist Church, Columbia, TN and does freelance video/audio in Nashville.